Please see details below of three events with Naomi Goldenberg over April. 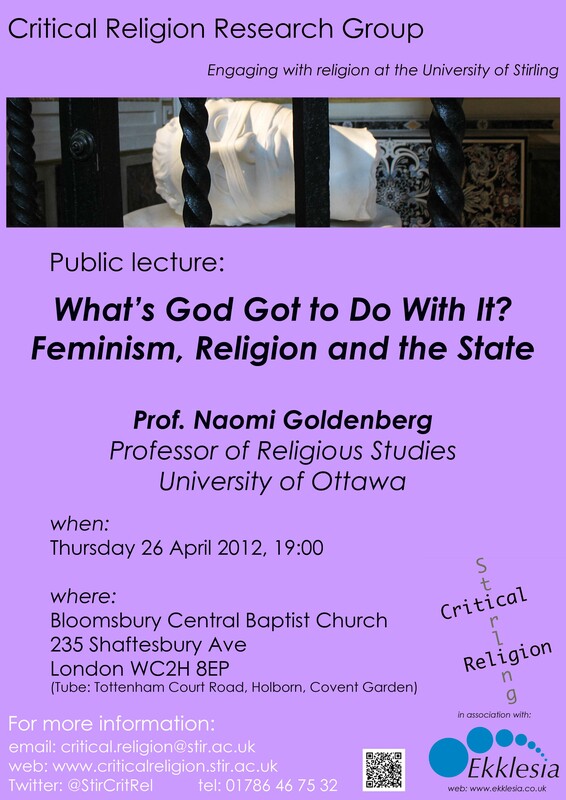 The Critical Religion Research Group is delighted to be hosting Naomi Goldenberg,Professor of Religious Studies (Department of Classics and Religious Studies, University of Ottawa), for a visit to the UK in April 2012. Prof. Goldenberg will be speaking in three locations: Stirling, Aberdeen and London. Details for each location are noted below, as are some notes about her current research. The Critical Religion Research Group is also happy to facilitate media enquiries regarding Prof. Goldenberg’s visit. Unless otherwise noted, all general enquiries should be directed to Dr Tim Fitzgerald. Room E26, Pathfoot Building, University of Stirling, at 15:00.